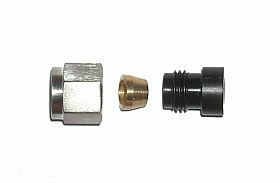 Steel Weld/Compression Fitting Made of the highest quality carbon steel, this anodized fitting is the perfect solution to fitting problems. Won't become loose or back out even during extremely long, hard runs. After drilling header pipe, center fitting over hole and weld a bead around base. You are ready to install the sensor. Comes complete w/cap and ferrule.